Have you ever wanted a card ASAP but didn't have one handy? 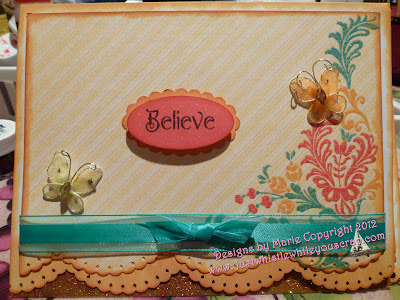 Or have you ever wanted to make a card really fast but didn't want to cut a million pieces for mats, framing, whatever? This is where paper cut to card size comes in. People ask me why I buy 6x6 or to 8x8 paper. Not only is it the size you need, the graphics are also smaller so using the paper on cards and smaller scrapbooks is ideal. There are times when less is better. I love DCWV papers. I go to Joanns and buy them in multiple packs. I fell in love with the Mariposa DCWV papers and I bought the 6.5" and 12x12 paper pack. The design was already "built-in" to the paper...all I had to do was add the embellishments. The design on this paper feels like a textured embossed pattern and is slick and glossy. The aqua leaves are also embossed but with glitter. The picture does not do this paper justice. I used Martha Stewart punches and SU punches. Also used was chalk ink pads to add color around the borders. 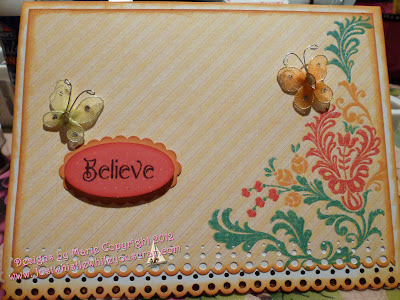 The phrase "Believe" is embossed and is from Emma at Creative Time . I added butterflies I had in my stash. The ribbon was white but I used a Copic marker (the broad end) and colored it. That's what I love about Copics and Spectrum Noir pens...all you ever need is white ribbon and you can color it to whatever color you desire. At the bottom I used 7ml Sookwang double-stick tape and added Elizabeth Craft Glitter Ritz in copper. 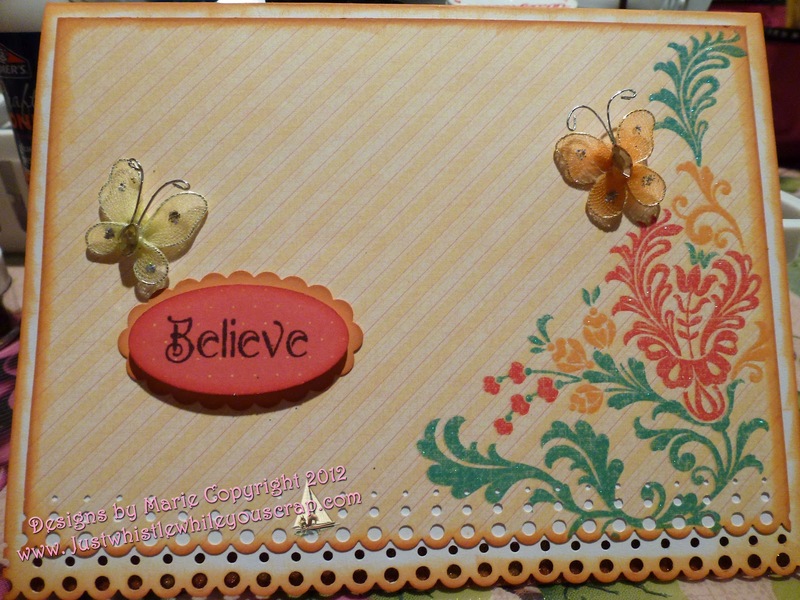 I took the same basic image but changed the punch design on the bottom and took away the ribbon and glitter. Sometimes the look of clean and simple is best. These cards took less than 10 minutes each to make. Make a whole bunch of this type of card so when you need something quick, just pull out the oval pattern and write your sentiment for any occasion. Today's lesson: Look close at the paper or cardstock you are going to be using. If there is a pattern on it (even if your paper is 12x12), turn your paper in all directions and find the design you would like to use and use it as your focal point or as a background design. There are times you can cut out the design from the paper to make it happen for you. 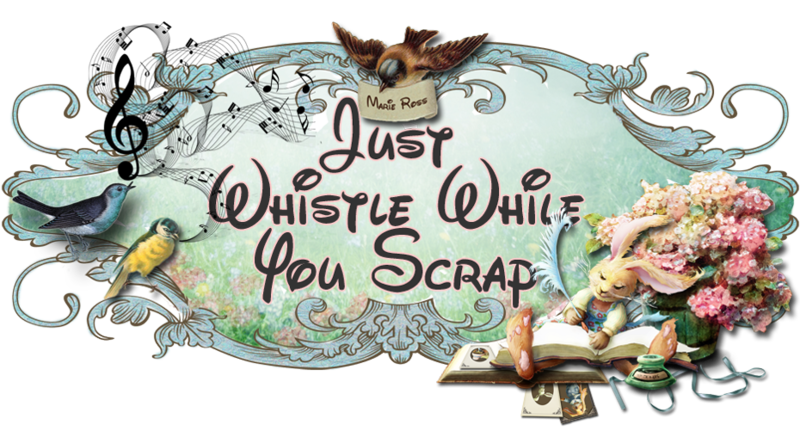 So many ways to scrapbook and make cards....so little time!! Just a head's up....next Friday is our Lady Anne's Friday Sentiment Challenge! Please do not forget and enter to win a fabulous prize! Good luck everyone! I will be on a two week cruise to the islands of Hawaii starting tomorrow (I know, how sad this is.. :) as I try to recuperate from the ongoing ankle/foot surgery. I hope the Hawaiian sunsets and beautiful beaches can clear my head and give me a more positive attitude. I don't know if I have the time to post, however, when I get home I will be putting up some of my better photographs. You know I will be very busy scrapbooking my trip! Beautiful cards, Marie. Have a great time on your trip. I'm green with envy.